Stylish full sleeves polo neck tee from the house of Zero. Smart collar neck with print on solid color base gives this tee a stylish look. Pullover styling ensures easy and fuss free dressing. Crafted from soft fabric, this tee will be a perfect choice for casual hangouts. The soft fabric of this tee will keep your little kid always comfortable. Styling Tip: Mix n match this Tee with jeans or shorts to complete the look. With season focused offerings that blend in both key fashion inputs dictated by International trends and the highest quality standards, Zero! 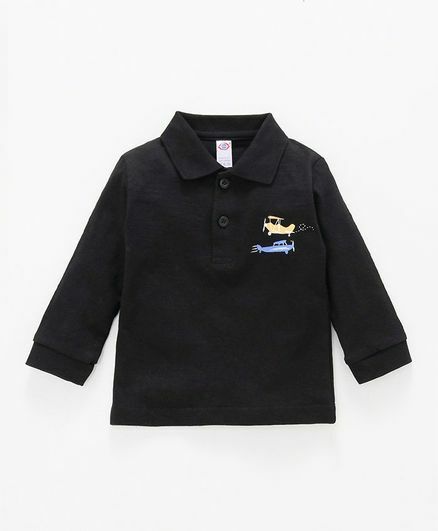 has established itself as a leading player in the kidswear segment today.